Aviation Updates Philippines - The Philippines' leading budget carrier Cebu Pacific has temporarily suspended flights between Manila and Laoag. The airline's last flight in Laoag was on January 13, according to the Civil Aviation Authority of the Philippines. TEMPORARILY SUSPENDED. Flights between Manila and Laoag by Cebu Pacific was temporarily suspend. No word from the airline yet as of posting. The suspension of flights started on January 14, leaving rival PAL Express to monopolize the route. On the other hand, PAL Express had increased flights to Laoag to compensate the lost frequencies when Cebu Pacific left the route. Cebu Pacific did not immediately reply when asked for comments related to the suspension of the route. Although Laoag is still available when choosing a departure or arrival city from its website, there will be a note saying "Sorry, flights for this day are either sold out or unavailable. Please choose another date, or search again" when you do mock booking. “We were surprised that they had suspended their operation because when we checked the record at the Laoag airport, it showed that CebuPac flights were always fully booked,” said Xavier Ruiz of the Ilocos Norte Tourism Office. Flights were mainly fully booked because of the airline's economic promo fares. 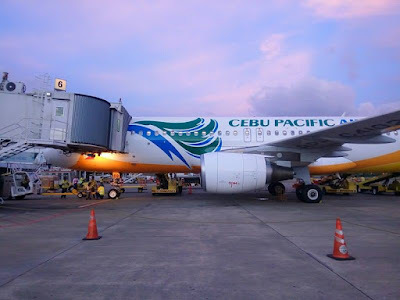 According to a report by the Philippine News Agency, Cebu Pacific started flying to Laoag on June 8, 2006 at least three times a week with its then brand new Airbus A319 with a 160-seating capacity.